166,785 votes, 39 candidates, 28 Assembly members elected, 10 women MLAs– it was another landmark election for Sinn Féin coming weeks after the Leinster House general election. In this year of remembering 1916 it was more poignant that as Six-County voters went to the polls on 5 May it was the 35th anniversary of the death of Bobby Sands hunger strike in the H-Blocks of Long Kesh. How far we have come since then, when Bobby was elected an MP for Fermanagh & South Tyrone on 9 April 1981. Oliver McMullan was elected on the twelfth and final count in East Antrim, tenaciously holding the seat won here in 2011. Finding friendly transfers is difficult in a constituency where the DUP dominates and where unionist votes for the DUP, UUP, Traditional Unionist Voice and now UKIP account for just over 65% of the vote. McMullan did it though with 8.1% of first-preferences a repeat of his 2011 performance and more than double the SDLP vote. A small decline in vote share didn’t stop Daithí McKay holding this seat on the tenth count for Sinn Féin. The party won its first seat here in the 2003 Assembly elections and has held it in the three subsequent Assembly elections. McKay, still only 31, must now count as an election veteran. Daithí won 12.9% of first preferences. Mitchel McLaughlin won a seat in South Antrim for Sinn Féin in 2007, moving then from Foyle. The former Sinn Féin National Chairperson and Assembly Speaker stepped down this time, having announced in November that he would not be running for re-election. 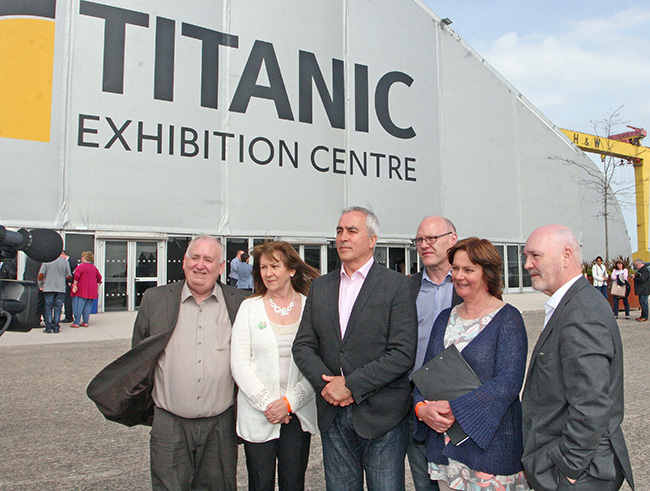 Current Sinn Féin National Chairperson Declan Kearney was the Sinn Féin candidate this time around. He was second on the first count, with 13.2% of the vote, and was elected on the sixth count. Niall Ó Donnghaile – Sinn Féin councillor, former Mayor of Belfast, and now Oireachtas senator – was the party candidate in East Belfast. Niall’s 2.5% of first-preferences was slightly up on the 2015 Westminster election for Sinn Féin in this constituency. Sinn Féin held their two Assembly seats in this constituency. 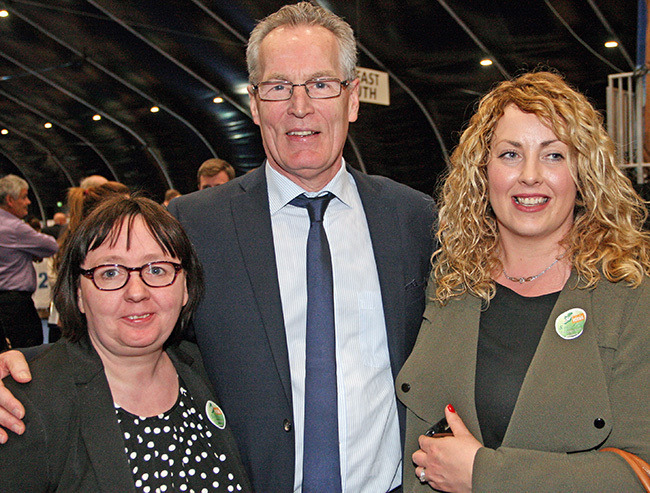 Sinn Féin policing spokesperson and Deputy Chief Whip for the party at the Assembly, Gerry Kelly, topped the poll and was elected on the first count. Carál Ní Chuilín, the outgoing Sinn Féin Minister for Culture, Arts and Leisure, was elected on the eleventh and last count along with the five other Assembly members in this constituency. 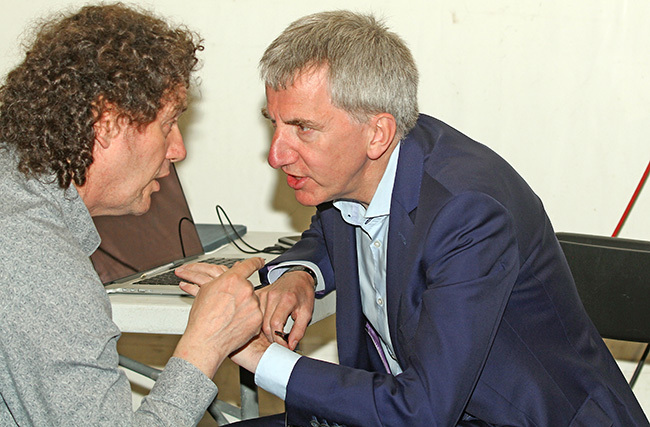 Sinn Féin’s charismatic MLA Máirtín Ó Muilleoir topped the poll in South Belfast with 14.2% of first-preferences, up from 12.5% in 2011. Máirtín had been co-opted into this seat in 2014, and has held it for the party. For the record, his first election for Sinn Féin was in 1985! 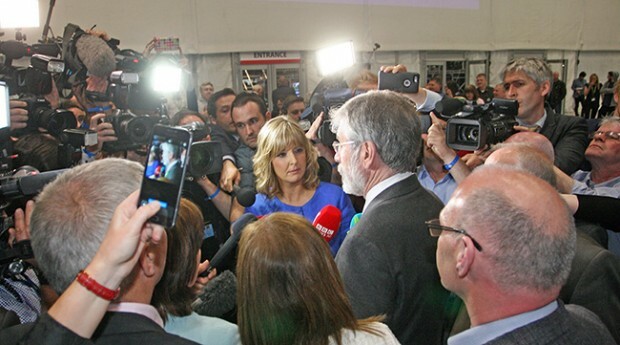 While Sinn Féin faced new competition across the 18 constituencies, the news media focus was particularly on the contests in West Belfast and Foyle. The party vote in West Belfast has decreased but Sinn Féin retained four of the five Assembly seats they had won in the constituency previously in widely-acclaimed vote management strategies with 54.5% of first-preferences. Alex Maskey was elected on the second count, Pat Sheehan on the fourth, Fra McCann on the fifth, and Jennifer McCann on the sixth. Rosie McCorley was eliminated on the third count. 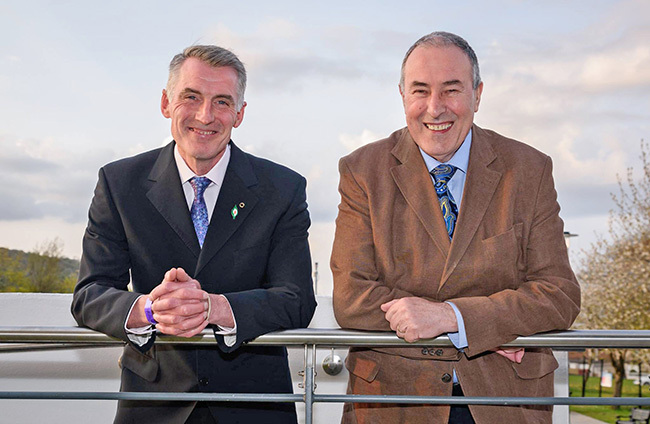 Sinn Féin ran two candidates in East Derry as the party vote rose slightly to 21.8%. A breakthrough in this constituency was made in 2003 when Francie Brolly won the seat which has been held since. Cathal Ó hOisín won the seat in 2011 and this time had Caoimhe Archibald as a running mate. On the first count the two were third and fourth, just 500 votes between them. As the counts progressed, the difference between the two Sinn Féin candidates remained. On the ninth count, Caoimhe was elected to the last seat with Cathal unable to reduce a 640-vote gap between himself and the SDLP’s Gerry Mullan. A second Sinn Féin seat must be a target in 2021. Therese McCartney was the Sinn Féin candidate here, polling 1% of first-preferences, she was eliminated on the fourth count. Sinn Féin ran three candidates in this constituency, winning 31.1% of the vote, while the SDLP vote declined 4.3% to 31.4%. In 2011, Sinn Féin and the SDLP both won two seats with the DUP and UUP winning a seat apiece. 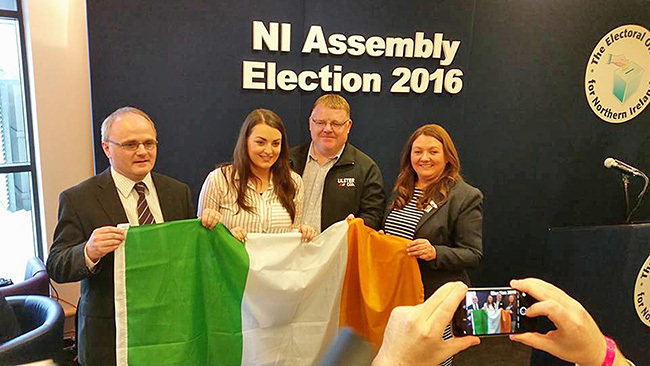 Caitríona Ruane and Chris Hazzard retained their seats while Michael Gray-Sloan was eliminated on the fifth count. After the loss of Sinn Féin’s seat in the 2015 Westminster elections by just 530 votes, Sinn Féin ran an ambitious four candidates in Fermanagh & South Tyrone, winning 40% of first-preferences. The aim was to try and hold the three seats won here in 2011. Unfortunately, Sinn Féin only took two seats this time even though the party vote share was unchanged from 2011. Michelle Gildernew secured 14% of the first-preferences and was elected on the fourth count. Seán Lynch, elected on the seventh count, won 10.1% of first-preferences. Phil Flanagan, who was elected to the Assembly in 2011, won 7.3% of the vote and was eliminated on the fourth count. His transfers put Seán Lynch and John Feely, the remaining Sinn Féin candidates, closer to a quota. Unfortunately, Feely was narrowly beaten by the SDLP for the last seat who passed him on the final count through 1,283 Ulster Unionist Party transfers following the election of Alastair Patterson and Rosemary Barton. Sinn Féin’s Martin McGuinness returned to Foyle for his first election in this constituency since 1996 and topped the poll. Not too shabby for a 20-year gap! 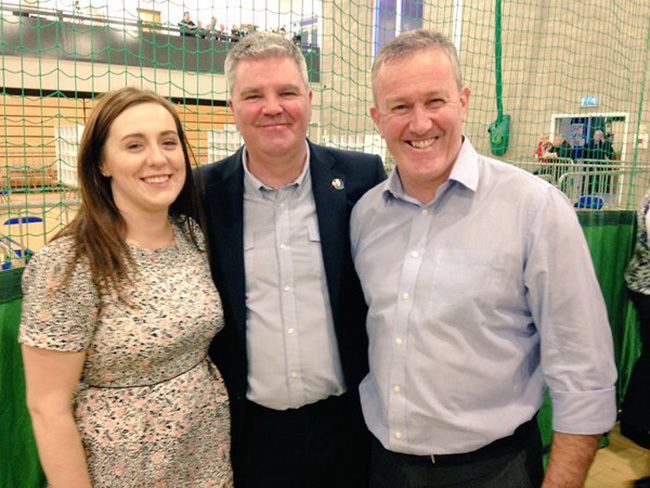 Sinn Féin’s Raymond McCartney retained his seat on the sixth count with the transfers of Maeve McLaughlin, the third Sinn Féin candidate, electing him and McGuinness. Jackie McGeough was the Sinn Féin candidate in Lagan Valley. She also ran in the 2015 Westminster elections and for the Lisburn & Castlereagh council area in 2014. This time Jackie polled 2.7% of the vote and was eliminated on the fourth count. Sinn Féin ran three MLAs here, aiming to keep the three seats won in 2011, and every election since 1998. The party polled 46.7% of the first-preferences. 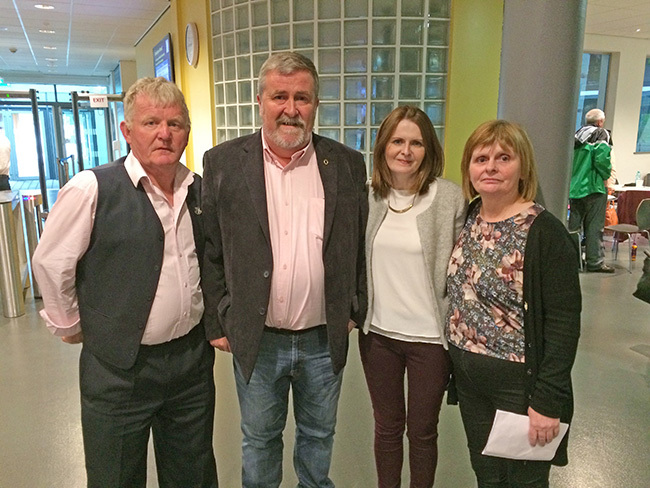 Good vote management brought in the Sinn Féin candidates in three of the first four positions. Ian Milne topped the poll with 17.3% of the vote. Michelle O’Neill came third on the first count with 15.1% of the vote followed closely by running mate Linda Dillon on 14.3%. They were all elected on the first count. Another positive vote management operation for Sinn Féin, where the party have held three Assembly seats since the 2003 election, with just under 41% of the vote. 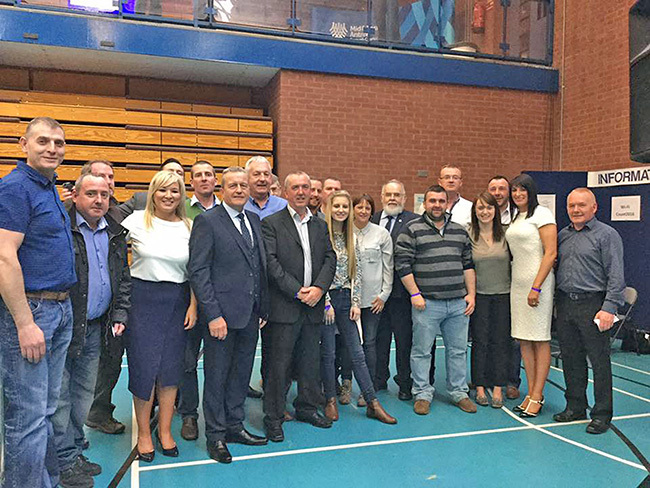 Sinn Féin’s candidates were placed second, third and fourth after the first count, with Meagon Fearon and Cathal Boylan elected on the first count. Group leader of the Sinn Féin team in the Assembly, Conor Murphy, was elected on the ninth and final count, beating the SDLP by 740 votes for the last seat. Sinn Féin narrowly missed out on winning a second seat in Upper Bann in 2011. This time the party did it with 24.9% of the vote. Councillor Catherine Seeley and Assembly Education Minster John O’Dowd split their vote expertly, coming in third and fourth on the first count. Seeley was on 13.5% of first-preferences, O’Dowd had 11.4%. Both were elected on the eleventh count with O’Dowd 168 votes ahead of the SDLP for the last seat despite early BBC speculation at the count centre that John could well lose out. Dermot Kennedy, who has run here from 2003 to 2007 for Sinn Féin, got 2% of the vote and was eliminated on the second count. Sinn Féin tried a four-candidate strategy here, electing three, with 42% of the vote down from the one-off high of 50.1% in 2011. Barry McElduff and Michaela Boyle were second and third after the first count with 11.8% and 11.5% of the first-preferences respectively. Grace McDermott and Declan McAleer were seventh and eighth with 9.6% and 9.2% of first-preferences. 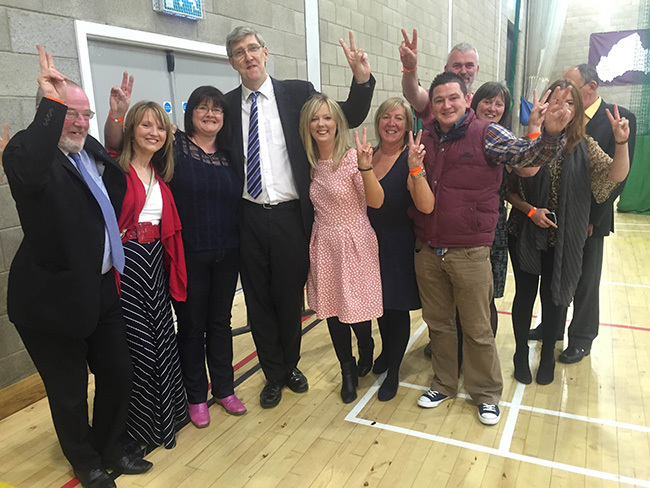 It came down to the eleventh count where the three Sinn Féin MLAs were elected, Grace McDermott missing out.